Sometimes life takes paths that we do not want it to take. Sometimes things happen that we know will happen, but that we do not want to happen. There is a thing called death, dying, loosing a loved one, that we are never completely ready for, even if everything points into that direction. Last month, just 3 days, after I posted my #1000Speak post, my mother passed away. In that very post I wrote about how I learnt about compassion during the last year, I did not mention how important my mother has been in teaching me about compassion. She could always lend an ear to a friend who needed listening to, or helped when it was possible to do so. I recall her being completely shattered by the situation in Libya a few years back, for her following the news was never a good thing. Never in my life have I felt so much compassion from others than in this past month. Once we started to announce to family, friends and acquaintances that she had left us, the words of condolences, compassion and love started flooding our lives. Of course these words will not be able to fill in the emptiness that my mother’s passing has left behind, but maybe these acts of compassion will help with the healing and keeping a vivid memory of her. was a sign of heartfelt compassion! I have not read every card, or email, or sentence written in the condolence book. I have not replied to any messages friends send me or comments that I received on this post regarding my mother’s passing away. I am taking my time, because with every day I realise a bit more what has happened, and every day I can heel a bit more. All this compassion definitely helps. Maybe you can imagine how touched I was by the tears of the caretaker of one of the neighbouring houses, when she asked me how my mother was doing and I told her that she had died. Her expressed compassion led me to comfort her myself. Or when I bought my eggs at the boucher’s the day he had received the card, his heart seemed broken. He told me that all day he had thought about the news and how even he never really knew my mother, her passing away marked him more than usually. Maybe it was her continuous smile, and her deep-seated kindness, she did not care what someone did for a living or how they dressed, all that counted was that you were another human being worth at least a smile, a nod and a “hello”. Only this week I crossed the path of young boy living in my parent’s building, he stopped me to say his condolences and was on the brink of tears, and that when he barely knew her. I was touched by the emails I received. A friend from school found out though my blog post Breaking the Silence, his email is so kind and encouraging, bubbling with strengthening compassion. A fellow blogger wrote me an email once she read my post, another act of compassion. And all of your comments on that very post have been so moving, so full of love and compassion. Thank you! I never asked for any of the compassion I have received this past month. I had no idea that there would be so much compassion in such a situation. But I am grateful for all of this compassion. 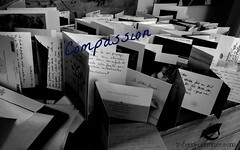 For everyone out there who is compassionate, thank you! You are making someone’s life a bit easier today. You are the ray of light on a cloudy day. This post is part of the #1000Speak linkup, this month’s theme is compassion and happiness, but I have focused only on compassion. Please make sure to check out the other posts of the linkup, and maybe join this month with your own post? Having lost both parents I offer my deepest sympathies Solveig. I’m not sure if this helps but I’d like to offer two thoughts to you just now. Grief is never a straightforward path – it has a happenstance approach, popping out when you may least expect and it took me a while to allow that to happen to me and embrace it. The second is I do not think of time passing and understanding as healing – at least for me. The wound can, even 6 years on, seem raw and immediate at times. What i think has happened to me, is other more immediate experiences dull and cover it but it can still bubble through. And in fact now I am grateful when this happens as it feels like they are still by me at those moments, the memories of the,m are all the sharper and the residue of that presence lingers like a half remembered perfume. So sorry to see you lost your mother last month Solveig. I echo what Geoff says above about allowing and embracing grief, and about how it can hit at unexpected moments. Losing a parent is big, and I’m so pleased you’ve felt supported by people’s compassion. It sounds as if your mother was a special person, loved by many. Solveig my heart does go out to you. My mom suffered five years of strokes. How she lived through as many as she experienced shocked the nurses as well as me. When she finally died it was both a blessing and a shock. I think I mentioned that the stress I dealt with is what pushed me into writing. Remember though… your mom may be physically gone from your life but she is still a big part of your heart and thoughts… she will always be there. You learned some wonderful lessons from her. You are VERY lucky to have had a caring and loving mother. If I were closer I would give you a BIG HUG! Allow yourself the time to grieve and express your feelings, whatever they may be… it is a form of nurturing yourself! HUGS!! Wow. A lot can happen in just one munth can’t it? I have not yet lost my parents, but I was nearly as close with my grandparents. It hit me hard and I still have my moments, of thinking how unfair life can be, even more than five years after losing the last of them. But suddenly, something will be said, or I will notice a certain trait in one of my parents or even my nephew the other day, and I know they aren’t truly gone entirely. Keep watch out, as you begin to heal some, and you may see the same sort of thing. I am glad all the condolences have been of some comfort, even in the slightest, in the last month. So so sorry to hear too. sending you huge hugs, I know the pain of losing a Mother. Solveig, your post pulled at the strings of my soul. It’s beautiful. Sending you big hug. You are amazing!